Pioneers in the industry, we offer safe seat cover from India. 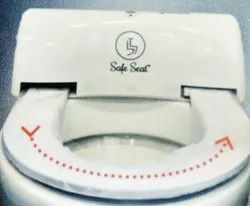 Safe Seat is a hygienic, intelligent and a self cleaning toilet seat cover technology. It is an electronic and an automatic sanitary machine with a sensor attached in each seat. The idea is to give every user a new, fresh and clean seat. Open the top cover of the machine and give the power through the direct supply. Open the top cover of the machine, take out the battery and have it recharged with the adaptor. A red line will appear on the film when the last 10 rotations of film roll are available. It reminds you to replace a old film roll.